Professor Layton vs. Ace Attorney is a proper collaboration, says Capcom's Keiji Inafune, even if it was tricky getting it started. The Phoenix Wright/Professor Layton crossover has a lot of people excited, even if it is only bound for Japan at the moment. But Inafune is amazed that it even exists at all, saying that he thought it was going to be nearly impossible to get off the ground. Speaking in an interview with Japanese gaming magazine Famitsu, Inafune revealed that Capcom handled the Phoenix Wright franchise very carefully, and thought it would be incredibly hard to convince series director Shu Takumi that the idea of a crossover with Layton was worthwhile. Inafune gave all the credit for the the idea coming to fruition to Level-5's Akihiro Hino, saying that he came up with the initial concept - and later became the scenario writer for the project - and was able to persuade Takumi that it was something worth pursuing. It also turns out that the "vs." in the Japanese title is more than just for show. 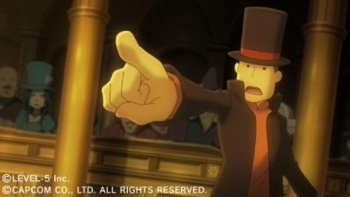 Wright and Layton will face off against each other during the game, before eventually coming together to solve a really big case. Inafune thought that fans wanted to see both things happen, so Capcom and Level-5 had obliged. This isn't going to be one company's interpretation of the other's character either. Inafune said that both Capcom and Level-5 were "fully involved" in the project. "It wasn't a case of licensing out the Phoenix Wright characters and demanding our license money," he explained. "That isn't collaboration, and users would see that. For this standalone game, we wanted to create a great history."